I received this for Christmas this year (don’t I have an awesome wife?). Up until Christmas morning, I’d only seen it in pictures, so I was shocked at how heavy it was. At first, I thought it was polystone, but upon further inspection, it appears to be made out of a very dense resin. 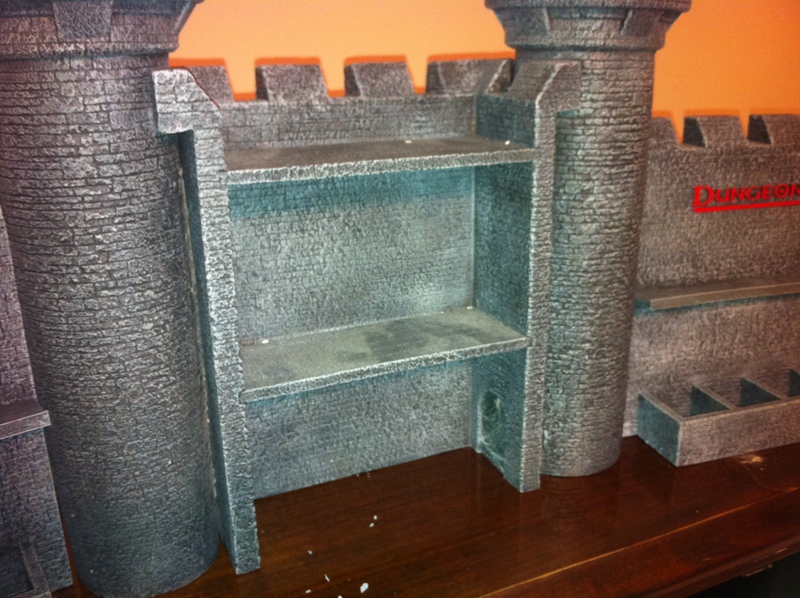 The D&D Dungeon Master’s Keep – Ultimate DM’s Screen comes in three pieces. They don’t attach to each other, but this isn’t really a problem since they’re so heavy it won’t fall over or be knocked out of position by someone merely bumping into your table. You’d have to be pretty careless to scratch your table with the smooth bottom, but if you have concerns, you could easily cover the bottom with felt (not included). 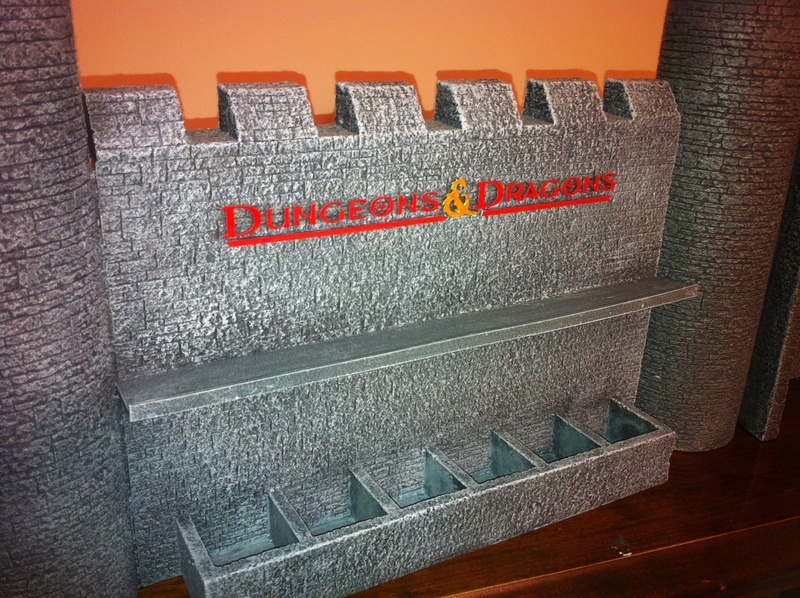 The back side of the screen features shelves and storage for tokens, miniatures, and dice. Each tower on the center section is hollow and can function as a dice roller. One, which you can see in the above picture will roll the dice toward the players; the other will roll the dice toward the GM. You can see in this next picture the front-facing die roller, as well as the front gate and emblem. The gates do not open. 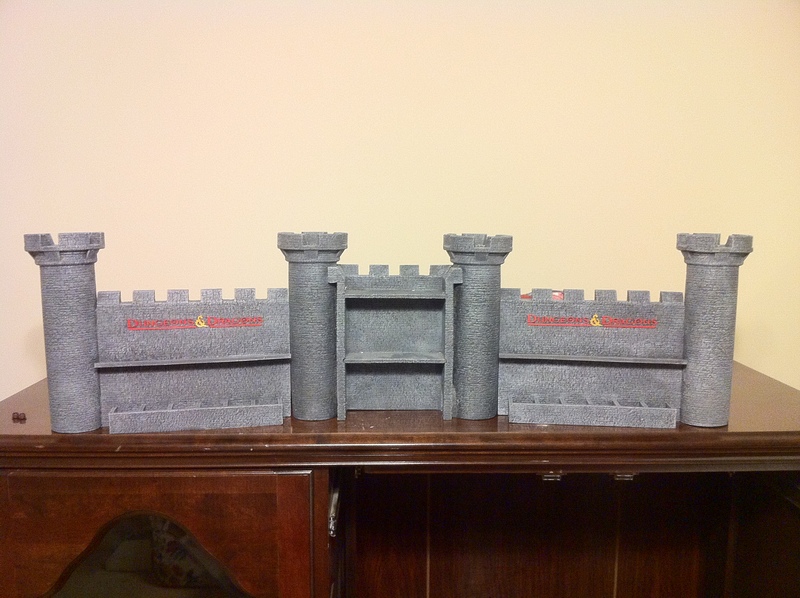 Not that you would want them to; this is a barrier, not a piece of miniature terrain. I said this was a barrier, and that’s essentially what it is. There are no charts, no ability to customize it to show crucial information for your game. This is designed to stand between the GM and the players. 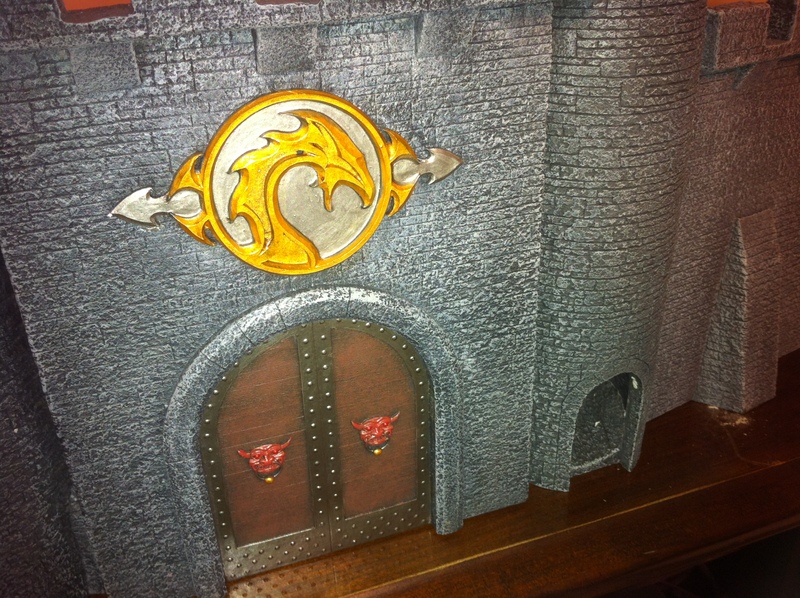 It keeps notes safe from peeping eyes, and provides nice storage niches for tokens and other accoutrements that seem to aid games like D&D 4E or the current version of Warhammer Fantasy Roleplay. The left and right sides are essentially identical, albeit mirrored versions of each other. They both have the current Dungeons & Dragons logo above a shelf which itself is above six small bins. The center section has two shelves, suitable for larger miniatures, as well as the second die roller exit. I can imagine sitting behind it would give one the feeling of lording over his or her players. Or, if you’re smaller in stature, keep you completely hidden, the ominous voice from the keep, as it were. 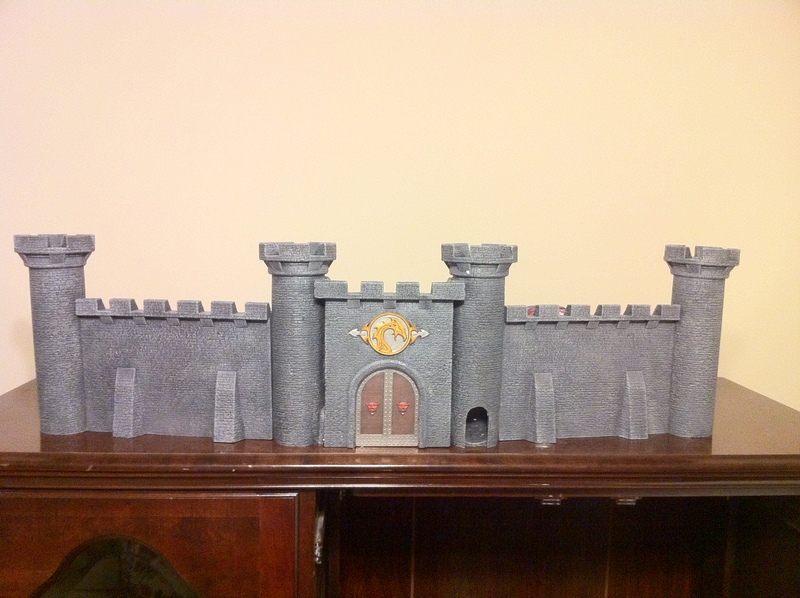 It could double as a pretty wicked piece of miniature terrain, particularly if you wanted to run a siege scenario of some sort (it’s a multitasker!). While running the sort of game that’s loose, free-flowing, with no tactical combat, the Dungeon Master’s Keep – Ultimate DM’s Screen will probably be of little value. If you hate Dungeons & Dragons (you’re probably not reading this blog), you probably won’t be a fan of the logo that’s prominent on 2/3rds of it. If you run a game that has a lot of fiddly bits, it provides handy, convenient storage for said fiddly bits, though you’ll want to keep your reference charts handy elsewhere. I have yet to see how it will fit on the end of my Spartan gaming table from Geek Chic. When you set this screen up, there is NO QUESTION which end of the table belongs to the Dungeon Master. Some people don’t like the barrier GM screens create between GMs and players. Some people insist upon it. If you don’t like screens, you wouldn’t be buying this anyway, unless you’re a collector. It actually makes a pretty impressive display for prized miniatures. Or you can hunker down behind it and launch Nerf darts at your cat*. *I have not done this…yet. I imagine you could probably engineer a way to hang some charts on the inside, though last time I DM’ed I found that having the quick reference sheets on the screen was awkward (did not help that the lighting was bad and the screen served to shadow everything I needed to see). I think it would make for cool ambiance to have some flickery LED candles behind this screen in a darkish room. So, a subjective question, but do you think it is worth 100+ dollars? I will probably lay any reference charts I use flat on the table behind the screen when I use it. LED candles would look pretty cool in the tops of the towers. Thanks very much for the review, I just saw this thing on the gf9 site and really want one now. Bought one of these. Took ages to get it but we’ve been using it now for over the last 18 months and it’s great.